Ice Nine Online built an SEO-optimized website for an Illinois cultural institution. Barrington’s White House began with a vision. To turn their historical and cornerstone mansion on Main Street into the heart of their town. A cultural center for concerts and classes. A meeting place for corporations and non-profits. A warm and welcoming home for community members to host their life’s most special celebrations. Ice Nine Online partnered with top-tier creative agency Blu Sky Creative to build a WordPress website that puts the warm, welcoming nature of the venue on display. The impression of a luxury experience is evoked on-site. 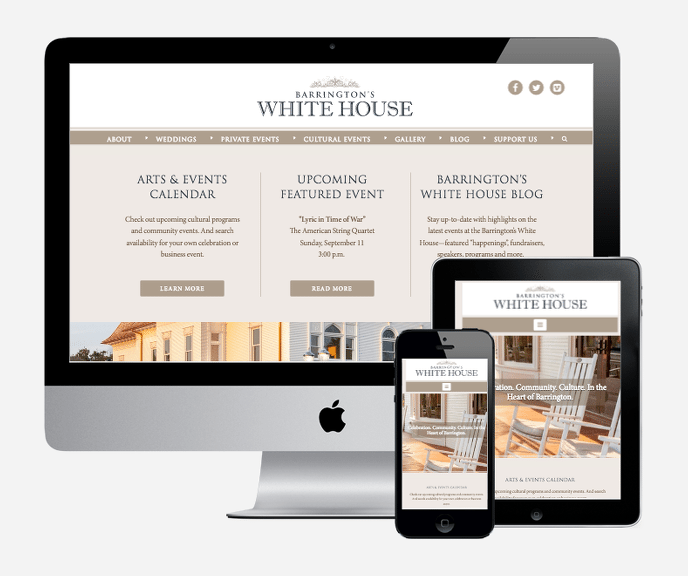 The website also highlights the various events that Barrington’s White House hosts along with featuring upcoming events via an interactive on-site calendar.